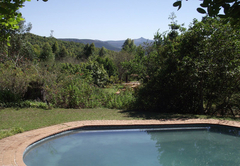 Ekukhanyeni is one of the highly recommended Nelspruit guest houses and provides accommodation in 10 guest rooms for tourists visiting the Lowveld Legogote region. 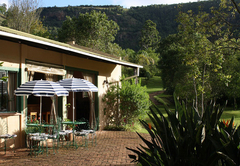 In the heart of the Mpumalanga Lowveld nestled at the foot of a majestic cliff, lies Ekukhanyeni Guest House. 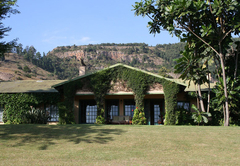 Surrounded by magnificent natural and manmade forests, with panoramic views, Ekukhanyeni embraces all that is peace and tranquillity. Ekukhanyeni is ideally suited for all kinds of group activities, such as family reunions, birthday celebrations or just a group of friends spending quality time together. 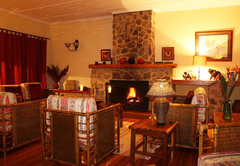 We also cater for group or individual retreats. 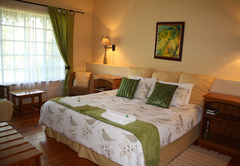 Attractively decorated, the Guest House has 10 beautifully appointed double rooms with en-suite bathrooms. Our country cuisine is superbly presented and what more could you ask for after a day of intense relaxation than to spend some time in our cozy, outside TV lounge while waiting for your meal to be presented to you in either our dining room or outside under the African sky in our boma. Enjoy a dip in our sparkling pool, an ideal way to cool down after a hard days relaxing, or visit our quaint little chapel for some quiet time. For children we have a recreational hall, where the kids can play some table tennis, pool, basket ball or darts. Enjoy the day exploring the Panorama Route with its breathtaking views and scenery. Or spend a day exploring the Kruger National Park. Ekukhanyeni is just 20 min drive from the Nelspruit Riverside Mall, golf courses, the Lowveld Botanical Gardens and the city of Nelspruit. 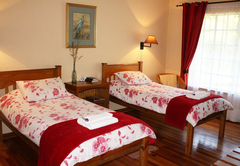 The rooms have twin beds or a double bed. The en-suite bathrooms are shower only. There is an overhead fan/ heaters. The room has tea/coffee facilities and stunning views. A place of extreme beauty and peace, this is a venue that will draw you back time and again. The mountains reflect the tranquility and nothing is too much trouble for the hosts. 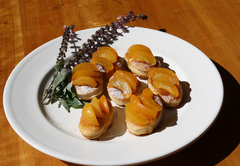 The food is delicious and the accommodation smart but in a relaxed way so you feel at home using the facilities. 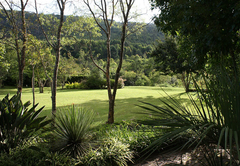 The grounds offer ample opportunity for walking and the views are superb! This is a place where you can recharge yourself in a beautiful settling while enjoying first class food and excellent facilities. Stephanie and Ian make you feel like family, they always go that extra mile for their guests. And Stephanie's breakfast is 7 star quality never the same and always something new to experience and treat your taste budds with. I was sad everytime I left there. Theres nothing like having a drink at the fireplace while the friendly staff tuck you in for extra warmth! Overlooking the mountains while swimming, or eating breakfast or being in the lapa brings a peace over you that cant be described! I love the people and the place!!!!!!!! While i was repping I could have choose a different place everytime but always went back to Stephanie and Ian! This place is highly recommended!